The heart-pounding moment a passenger jet lost part of its landing gear on touchdown at Amsterdam’s Schiphol Airport has been captured on film by a passenger. David Fleming was travelling on board Flybe flight BE1284 from Edinburgh when the aircraft came down hard on the tarmac at Schiphol Airport just before 5pm local time. Fleming posted footage to Twitter from inside the plane in the immediate aftermath. It shows how the aircraft made a rough and unorthodox landing, with the right wing propeller appearing to graze off the runway. A second image posted by Fleming depicts the stricken aircraft listing to one side, with the right wheel missing. According to the official Schiphol Twitter account, the plane’s landing gear collapsed as the wheels hit the tarmac. 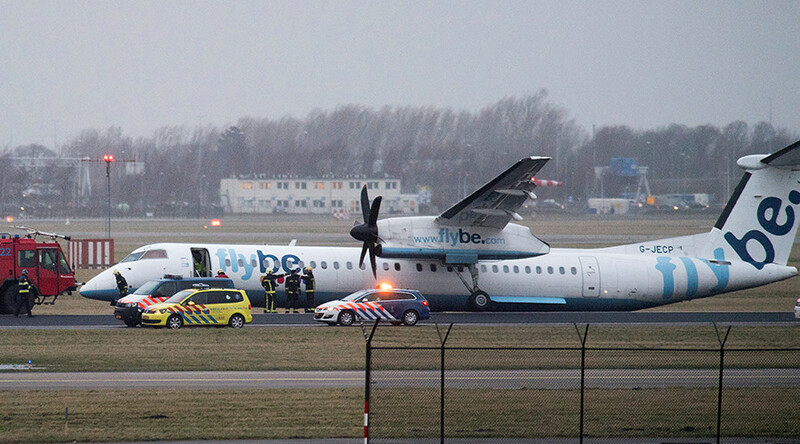 Flybe has confirmed that nobody was injured in the Thursday afternoon incident. The Bombardier Q-400 aircraft was carrying 59 passengers onboard. The landing gear of a FLybe airplane collapsed during touch down. All passengers are brought to the terminal by bus at the moment. "The safety and well-being of our passengers and crew is our greatest concern. Our pilots regularly train for situations such as this in simulators at our training academy in Exeter. Our cabin crew are also fully trained to deal professionally in these types of situations,” a Flybe statement read. “We will now do all we can to understand the cause of this incident and we have sent a specialist team to offer any assistance it can to the investigation." Further footage appears to show the Flight BE1284’s approach to Amsterdam in strong winds. An Amsterdam-based YouTube channel, which deals with aviation news, caught footage of emergency service responding to the crash landing during a livestream.